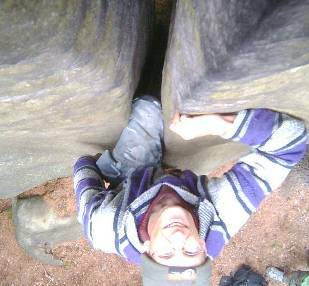 The following text was prepared for a crack climbing training course in 2005 as documentation. Later it was also translated to English, as it seems there was a greater interest in that. Crack climbing is mainly a question of climbing skills. Beginners will very often have problems with this, because each crack width requires its own technique and therefore it is complex and challenging. It is important not only what you make with your hands and how to jam, but especially in the wider cracks is crucial what to do with the feet. 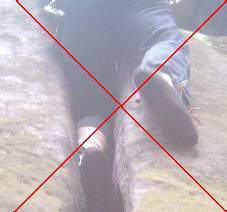 It is also important to climb a crack in a smooth and power-saving way and to use all rest positions, which the crack offers. One basic rule for jamming is that the contact surface rock to skin shall be as large as possible to keep the pressure and pain and risk of injury as small as possible. Another basic rule is that a jamming body part must never be moved under load (injury risk). If e.g. the position of the hand in the crack needs to be changed, then first the load has to be completely relieved, then the hand can be re-positioned, and after that it is possible to put weight on the hand again. Finger crack: A finger crack is so wide that just the fingers can be inserted. Even narrower cracks can hardly be climbed free and may only be useful to put Fiechtl pegs into. 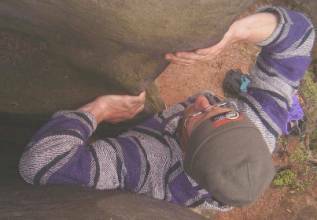 Finger cracks can be very difficult to climb as they offer near to no footholds. Finger crack: The fingers are inserted into the crack and the hand is slightly twisted. 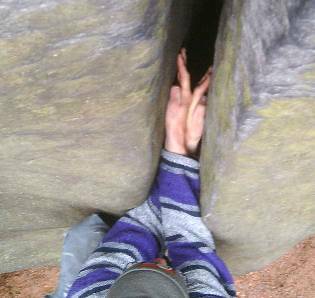 Narrow hand: Between finger crack and hand crack, very unpleasant to climb. Jamming is only possible if you try to get some leverage between fingers and thumb, which may get very power consuming. The range between finger and hand crack does not offer any good jams. One tries to insert thumb and forefinger as far as possible and jam with this. Hand crack: Crack, which just allows the insertion of the hand. 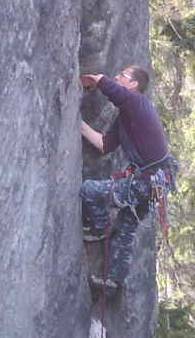 Hand jamming allows a relatively large area of contact between skin and rock and therefore hand cracks are quite easy to climb. The best width is the width where the hand just fits in; this is also the width with the best skin to crack contact and is least power consuming to climb. 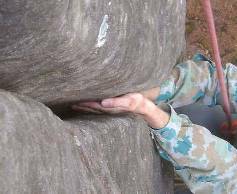 This width is sometimes also called "saugend" (literally translated "sucking", because the hand is just sucked in by the crack and you need no power to hold). If the crack is symmetrical and goes straight up, set one hand over the other, thumbs up. This is also the fastest way to get ahead. If the crack is tilted, is in a corner or jams rather bad, then it can be climbed right-handed or left handed. 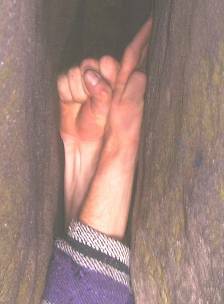 Climbing a crack right-handed means here left hand at the top, thumb down, and the right hand always following, thumb up. The feet are always alternated. To stand secure, the foot is inserted vertically into the crack and then twisted. This hand crack is climbed right-handed, which means that the right hand is always below the left hand, the thumb of the left hand is always pointing down and the thumb of the right hand is always pointing up. Feet in a hand crack. The foot is turned vertically, then inserted into the crack and then twisted..
Broad Hand: Width between hand crack and fist crack. A bit more power consuming and less pleasant than hand crack, as the skin to rock contact area is smaller. But it is possible to climb this width quite fast. Fist crack: A fist crack is the width where the fist just fits horizontally. The range for good fist jamming is very small. 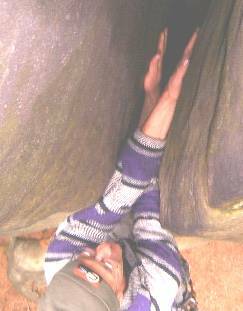 So climbing a fist crack is much more time consuming than climbing a hand crack, because it's always necessary to look for the good jams in the crack. Standing in the fist crack. To avoid that the foot slips, try to give a certain torque on the foot. The following sizes and techniques are often subsumed as offwidth, but here I will go through this in detail. 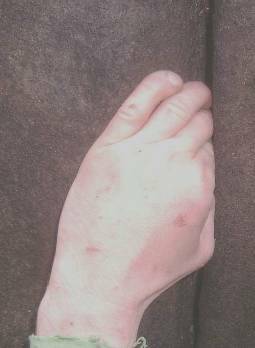 Arm crack: Crack width, just a bit too wide to allow fist jamming, also called "Klapperfaust". Very unpleasant, if not even the knee fits in, and awfully difficult if overhanging. This size needs an especially well trained technique, but may be climbed quite elegant. Double hand: For a double hand jam the arms are crossed, the back the hands are put together and the palms are used for jamming. The most important issue with this technique is to jam correctly with the knee simultaneously; as for double hand it is necessary to release both hands at the same time. 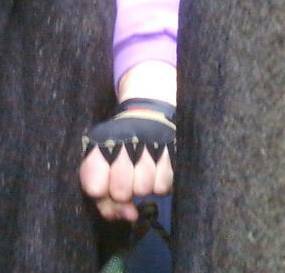 If the crack is slightly wider, it is also possible to use a hand-fist jam. Double fist jam is principally also possible, but the application range is similar small and therefore it is seldom used. Double hand jam. This way of jamming requires also a good technique for feet and knee, because it is necessary to release both hands at the same time. Good knee jamming creates rest positions and is a prerequisite for double hand jamming. Scissors - "Schere": For the scissors technique both arms are crossed and used as a lever. The leverage is controlled by the position of the shoulders, twisting them from vertical to horizontal. For the scissors technique it is not necessary to jam with the knees, but the feet must stand quite perfectly as the jamming effect is rather poor and slipping with the feet will result in a fall. With some experience in this technique, its possible to proceed rather fast; beginners however tend to spend too much power because of fear and to exhaust uselessly. 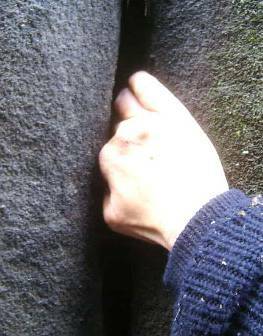 Half-narrow crack: Half-narrow cracks are characterized by the fact that hand-fist jamming no longer works and also the knee has a bit of room to move in the crack. 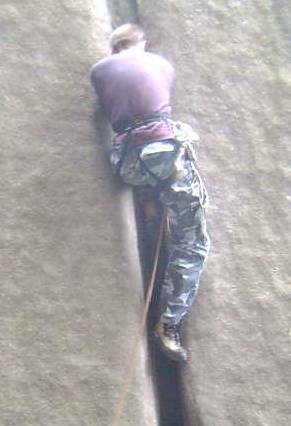 Half-narrow cracks are best climbed by the classical Schulterriss "offwidth" technique. Here one arm presses in the crack, the other hand pulls at the crack edge. At the same time, one tries to get one knee as high as possible into the crack. The other (outer) leg stays always stretched, standing in at toe-heel way and is only drawn after. Classical Schulterriss technique. One hand holds the crack edge and the other presses. 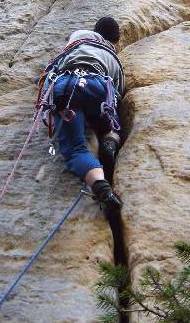 Foot technique in an offwidth. Good standing in a toe-heel way is crucial. To succeed it is always good to put some torque on the foot. Typical beginner mistake: The left knee is too low, there is no pressure on the foot, and the right foot is useless searching for nonexistent holds on the smooth wall. Wide crack: Wide cracks allow getting a bit deeper into them with the body, and they allow employing power-saving elbow jams, sometimes also named "chicken wing". Also the technique for the feet changes: Now the inner leg stays straight and is only pulled after. The outer foot stands toe-heel style, the knee is slightly bended. The upward movement is only performed with the outer leg in small steps. Narrow Chimney: In the narrow chimney at least the whole body fits in. 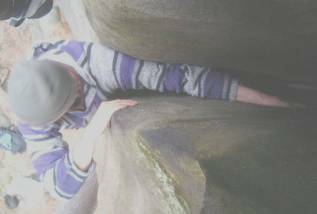 Climbing narrow chimneys is hardly exiting, as it's near to impossible to fall our or down. However climbing this can be very exhausting, especially as this is normally too wide for standing toe-heel. In some cases however, the frog technique can be employed. Here fore one jams the upper body with both shoulders and pulls both feet upwards as far as possible. For standing, one presses the heels together and the toes against the chimney walls. Standing in such a way allows pushing the body upwards. Combination of crack widths: A crack seldom has a constant crack width. And some transitions between crack widths are more difficult to climb that each corresponding crack width by itself. So the transition from narrow chimney to arm crack combines the difficulty of the narrow chimney to stand with the difficulty of the arm crack to find hold in the nastiest way. A widening in a crack is sometimes called Hundebahnhof. The difficulty is mostly not to get in, but to get out of it. An advantage of cracks is that it is quite easy to see from the ground what to expect. If the crack width seen is within one repertoire, then it is managed in most cases. Moving upwards in an offwidth can be quite exhausting. The point is here to use only the minimum power necessary and to user every rest position. 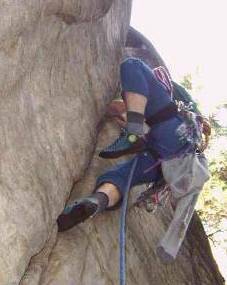 With a bit of training, nearly every position in an offwidth can be used as rest position. Also climbing down is worth a practice with cracks. It is much easier and less exhausting as one thinks; especially in offwidth one can slowly slide down and need very few power to keep oneself within the crack. If one has the ability to climb down at any point, also very sparsely protected cracks can be tackled. It's also worth to have a look at the hardware. Equipment, which may be nice for walls or friction slabs, can be horrible for cracks. Use shoes which are a bit stiffer and which go over the ankles. Especially with the narrow cracks there is the danger that the ankles are rasped off (painful and slow healing). A stiffer shoe is more comfortable standing in a toe-heel style. Use pullovers with long sleeves. Short trousers are also depreciated if knee jamming has to be implemented. Clothing should be robust, but not to smooth, tight, but not limiting the movement. Polyamide made training clothes have proven to be advantageous. Take only the hardware, which you really need, and hang it on the outer side while climbing offwidth. Trying to climb offwidth or narrow chimneys can be a useless effort if you look like an x-mas tree. Seat harness: In principle every model will do. But preferred are the cheap ones, as wear is high, and it is recommended to check the harness frequently and buy a new one. Tape: Reduces the risk of injury in harder finger, hand or fist cracks. But for narrow hand cracks it may be hindering and also the "feeling" for the crack is not there. Some consider the use of tape as crack climbing for wimps.